Okay, is no one commenting on the last post because you don't want to have to tell me I look like I'm in my late '40s? Because, I mean, I am so sure. Rainy Wednesday morning. Feeling like warmed-over hell from the past two late nights at the theater. Jarrah is home from school with fever and malaise, probably because she had her 5-year-old annual Well Child Exam yesterday. The irony does not escape me. Every time we go to that office she comes home sick. She plays in this carpeted pit with lots of consumptively coughing, mucus-covered cherubs, and like Invasion of the Body Snatchers, she is taken and becomes their pod. Or maybe she's having a reaction to the vaccines. Which can totally happen. Even though I made the executive decision to split the shots into two visits. I was telling Paul and Mary "Now don't go calling me Jenny McCarthy" and Paul said "I will not call you Jenny McCarthy. But I will call you Cameron Diaz, circa The Mask" and I said "How about calling me Sally Field in Places In The Heart?" Paul and I get like that sometimes. Joking aside, Jarrah awoke after her 16-month shots covered head to toe in a vicious purple, bumpy rash, and since no one was ever able to diagnose it, I've been wary of multiple shot extravaganzas ever since. Hearing: Passed the test, but barely: the kid needs a full professional ear-wax removal whenever we have these exams. After it was all out, she said "My voice is loud in my head!" 1. Those two tiny moles are normal. People start to get moles at some point. 2. That mark on her back that was once a scab is normal. People with darker skin have concentrated pigment. 3. There's nothing I can do for the eczema around her eyes except Aquaphor. Wait it out. 4. She doesn't have an underbite. Maybe her incipient six-year molars are bothering her. 5. At this age, there's nothing unusual about having 17 imaginary friends and arguing for hours with tiny rubber princesses. 6. Those storms of emotion ("You hurt my feelings when you said I don't like salad! Why can't I be a grown-up? Grown-ups make their own rules! WAAAHAAHAHH!") will pass by age eight or so. Meanwhile, back at our place, we've been breathlessly checking the morning post each day for kindergarten news, and nothing yet. A bunch of people at school have heard already, so I can only assume all the kindergartens are currently in a bidding war for Jarrah and we'll just have to wait it out. As for the theater world, I think I'm going to break my lengthy silence on the secret blog and write a long, juicy post over there today. Check it out! I wish I could tell you what it's called but I forget. Still, if you once had an invitation, it's still good, or leave me your e-mail if you want a new one. We met Mary, Paul and Joy at the Encinitas Street Fair on Sunday, and joined them for brunch at Honey's Bistro first. That place is awesome. There was a long line for the bathroom when we were leaving Honey's, but I didn't feel like peeing in a Porta-Potty later on, so I waited. It was not an unpleasant wait; Honey's is warm and bustling and smells like fresh-baked muffins. I admired my new straw hat in the glass bakery case. Suddenly, I heard the unmistakable warped yelp that is the first note of Steely Dan's "Hey Nineteen." I smiled. Without really thinking about it (because it's what I do) I started wagging my head and shimmying my hips a bit. There was a guy in front of me, who had smiled in a friendly sort of way when I joined the line. "It seems to be moving pretty fast," he said. I smiled back but didn't say anything, since this was one of those pointless things people say that actually have no meaning whatsoever. I couldn't tell how old he was. He had a few days of scruffy beard. Now he smiled again when he saw me recognizing the song. "Look at that. You and I did the exact same thing when this song came on." I smiled again and didn't respond, since I couldn't corroborate his claim, having not been looking at him. "It's a good song," he tried again. I smiled and looked away. I have my own sweet little history with the song, but I wasn't about to start telling him about it. "It's a good song," I said finally. "I remember listening to it when I was nineteen myself." He laughed. "Me, too! Let me guess--you're in your late '40s." I was stung but didn't pause. "No, I'm not." Good lord, I thought. That's his immediate guess? What the hell? When did this happen? I'm looking so fresh today! Lots of sleep! Youthful outfit! Hat covering those couple of sproingy grays! Sheesh! He was instantly chagrined, probably more from my stupid, stupid face than the three words I actually said. Because I'm sure my face said Oh. My. God. Did you just say that? He charged in hastily to repair the damage, swinging his rhetoric like a sword. "Not that you look like you're in your late '40s. Far from it! I shouldn't have said that. What I meant was, that's how old you'd be if the song had come out when you were 19. But that's not what you meant. You had been hearing the song for YEARS already. I was totally just thinking of dates. Not of how you look. FAR FROM IT. In fact, I can tell by looking at you that you're in your early '30s, right? Am I right?" Now I felt even worse. I had this thudding sensation in the pit of my stomach. Oh, he thinks that the truth hurts, and he's trying to fix it so he can keep talking to me. He wants me to be all appeased and mollified and flattered now, and mysteriously forget what happened in my girlish delight over his ridiculous suggestion that I'm in my early '30s. As if it were that easy. "A lady never tells," I said. "No, of course not! Of course she doesn't! I was just really stupid there." The door to the bathroom opened and a lady walked out. I didn't respond to Time Machine Man. I just lifted my chin and used it to indicate that the bathroom was now available. He walked in without another word. Of course I was still standing there when he emerged 30 seconds later, and I'd been practicing a smarter face. I smiled winningly, willing my crow's feet to look soft and charming rather than withered and papery. "Have a great day!" I trilled. "You, too," he said. Poor guy. He really stepped in that one. Jarrah: Look! (pointing at a dark circle in the dirt) It rained in only one spot! Sam: Or someone pissed right there. This morning when I dragged myself out of bed, Jarrah was eating some cinnamon toast in front of the telly (Thank you, David!) Next to her plate was my copy of The Selected Poems of Frank O'Hara, an arty paperback with a line drawing of a naked man on the cover. I'm talking a tasteful reprint of a Leonardo da Vinci, something of that ilk. Sam: Whatcha doing with my book? Jarrah: (slyly) Looking at it. Jarrah: (holding it up) Look. He's naked. Jarrah: I like looking at him. Sam: (turning away, on the pretense of searching for a spoon) Uhhhh....you do? Jarrah: I think he's handsome. Sam: Good lord. I need some coffee. Yesterday Jarrah's school held a toy swap in honor of Earth Day. We were asked to bring in toys that the kids had "outgrown" so someone else could love on them. The ol' "One kid's trash is another kid's treasure" theory. I, for one, was ecstatic, because Jarrah seemed to embrace the concept and finally allowed me to pack up her twin dolly stroller and a Lite Brite cube (my totally misguided birthday gift a couple years ago--she's never used it for more than three seconds) both of which were taking up space in our playroom, em, living room. 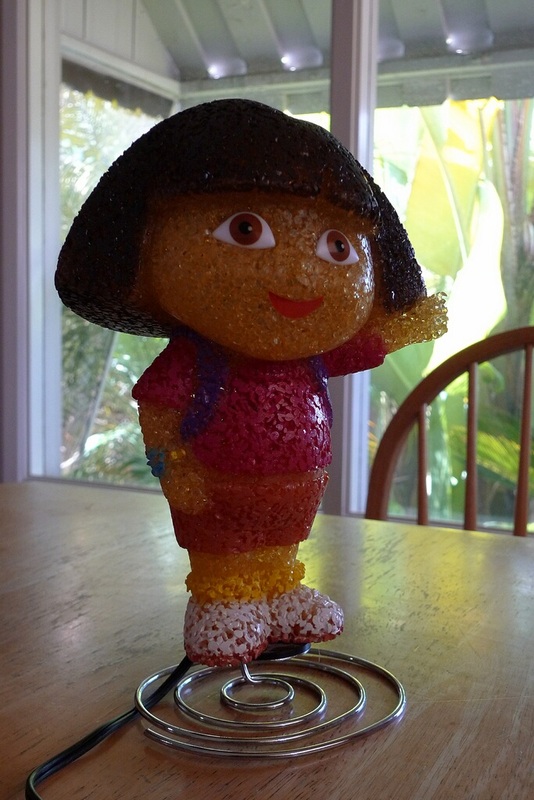 So imagine my delight when I arrived for pick-up and she led me ecstatically to her cubbie, wherein lurked...well, see for yourself: The Dora Lamp. 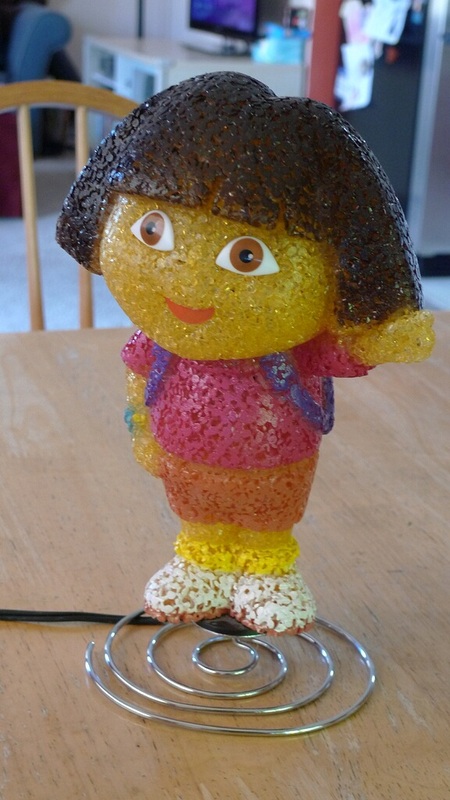 Perhaps you can't fully admire the texture of The Dora Lamp, which--if I'm not mistaken--is composed of masticated Fruity Pebbles that have been sculpted with a little kindergarten paste and perhaps some yacht varnish. Tasteful and subdued, similar to a Louis Tiffany. Of course I was so grateful that I immediately wished to know which generous child had been willing to part with Dora, and Jarrah was happy to tell me it was Sophia. Now that I think about it, Sophia's mother did scram with suspicious rapidity at the end of the day. All around us, delighted children were gleefully holding their new toys aloft. They had games and books and princesses, and every last one was thrilled. 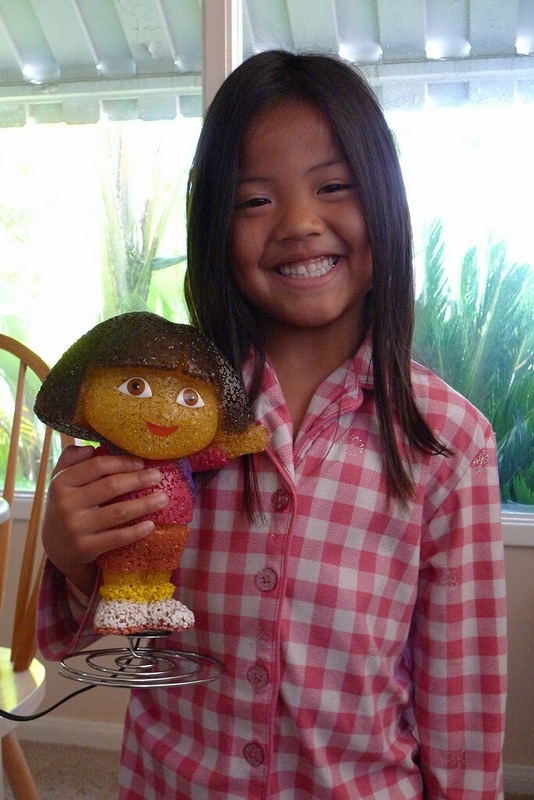 But my heart ached for them, because not one will truly know the joy of being the proprietor of The Dora Lamp. There will always be a little empty space in their lives where she could have been. Because that joy, Dear Readers, will be ours alone. Some of my friends were there, and I couldn't resist reveling in their misfortune and loss. "Did you see this?" I asked. "I feel sooooo bad for the rest of you. Because there is nothing in this room even worthy of the reflected light of this find. No, don't say a word. I can see on your faces that your hearts are in pain." For some reason, they laughed when I said that. Even though they have nothing to glow up on a cold and cheerless night. Poor, poor dears with their empty, non-illuminated lives. My favorite time of the week is shaping up to be this hour on Thursdays when Jarrah's at acting class and I am not expected to do anything but sit here at The Living Room and blog, drink coffee and eat naughty sweets. It's less delightful when I have to drive home in rush hour traffic and come back two hours later for rehearsal, but oh well. I am clearly not a stage mother, since just now one of the other girls' dads told me that his daughter was sick today but he just showed up to get her instructions or whatever. He said to Jarrah, "Practicing your songs?" and Jarrah stared at him blankly while I mused, "Ohhhh, that's what that CD from last week was for." Oops. So, what's new? My friends Mike and Laura are in town from DC, and I'm getting to meet their daughter Noelle, already 3, for the first time. Monday we went to the zoo, and yesterday the Aquarium. I am enjoying a little touristy time, the likes of which I haven't experienced since Jarrah was a toddler--there were a couple of years there when I felt like a San Diego tourism ambassador. I had a bit of a humiliating moment at the Aquarium, when I politely inquired at the Membership office if I could use some guest passes we have that are expired. My reasoning was that we are still members, so what difference does it make when we use them? Of course I didn't say that. I just smiled and asked if we could use them, figuring what's it to them? If I ask, I shall receive, is what I figured. When the membership lady said no, I probably would have just said "Thanks anyway!" and left, but she clucked her tongue and shook her head and said "Oh no, those expire." I started to explain that yes, I knew that, and she said "They have an expiration date right on them, that says when they expire." Again, I started to say YES, I REALIZE THAT but she continued "And after that date has passed, those passes are expired." "Please stop telling me they expire. I am aware they expire. That's why I'm here." The next thing that happened confused me, because if I had been her, I might have said "Have a nice day" and walked away. Instead, she said, "Can I see them?" I showed her. "Do you have guests with you today?" "Two adults and one child." "And they're here now?" Just then my phone made the texty noise, and I glanced to see if it was from Mike. It was. The message said: "Passped." I tried to interpret while the lady was talking. Finally, I realized she had said "Bring them in here when they arrive." Mike and Laura are sweet people. As I put it, "Laura is from the midwest, and Mike is Mike." They were eager not to be involved in any fisticuffs I'd inadvertently roped them into. But now I felt honor-bound to return with them to the office. And when we got there, the membership lady stamped their hands with a free admission. I watched this happening with dismay, and finally mustered the gumption to say "I'm sorry I got mad." "That's okay," she said, but she didn't look at me, and I could tell it wasn't. So the question is, why'd she do it? It was baffling to me, and made me feel guilty. Laura said maybe she just didn't want me going postal in her office. David said once she realized I wasn't just angling for free stuff but had actual visitors in my possession, she wanted to make a member happy. What do you think, Readers? As for me, I secretly suspect she just wanted to make me feel guilty. Which I did. For hours. In other news, I am haggard with nightly rehearsals. Last night I was on for almost two hours without a break and almost lost my voice. I have new blocking that I don't like because I'm supposed to be writing in a notebook for a big chunk of the scene. Feels so weird to me, but the director thinks it looks hilarious. Next week will be Hell Week, when I am backstage at the theater SEVEN NIGHTS IN A ROW. That is really hard because for the first four, there's pretty much no one watching, and hence, no one laughing. At least I only have one costume change this time, and no wigs. That I know of. Stay tuned. Well, I did it, Readers. Went to the dentist this morning and had my first fillings (two of 'em, upper right) without drugs in about five years. Now don't get too excited--I had Novocaine, of course. I'm not crazy. In fact, it's been nearly three hours and I still can't feel my lips. Is that weird? Do any of you experience Novo-numbness for ridiculous amounts of time? The happy-joy news is that it DID. NOT. HURT. I mean, it wasn't fun. She had some sort of curious cardboard discs that she wanted to decorate my mouth with--they were wedged into the sides, and one garnished my tongue as a sort of charger plate for an air-sucky device--and those made me want to freak out. The operative words are "want to," though. I didn't. The drill was loud, but I couldn't feel it. Oh, I didn't care for the noxious stink of the sealant at the end--I mean, wasn't I supposed to be breathing through my nose? Again, it was my first time exposed to the concept of sealing the fillings--I swear my last dentist must have gone to Bugs Bunny School of Dentistry. But again with the NOT HURTING. I lay there and watched (well, the parts I could see around the dentist's head) the movie "New In Town" with Renee Zellweger and Harry Connick, Jr. or at least 45 minutes of it. Luckily, I'll have plenty of chances to find out what happens when I have FOUR MORE APPOINTMENTS. Mostly because I am a wuss and don't want to spend 90 minutes in the chair, like, ever. But today, I am triumphant. I faced my fear and got through it without crying or hurling any expensive equipment around the room. Baby steps. So, Jarrah has just started an acting class at the same theater where I am rehearsing for Sylvia. In fact, the acting class is taught by Sylvia herself. In typical fashion, Jarrah is rapturously in love with all things related to this class--the stage time, the singing, learning her lines, her "friends" (all of whom are several years older and seem to be SAG-certified.) I will be very curious to see the "final presentation," but in the mean time I am asked every single day on the walk from school to the car "Is it Thursday? I have acting class?" This week, we arrived five minutes before class time and the door was locked, so we got comfortable on the steps. A moment later, another mom arrived with two other students, who told me they are eight. They were both very nice to Jarrah. The mom, however, was not inclined to speak to me, and sat as far from me as she could and still be on the porch. Oh well. I guess I do look kind of terrifying. The girls noticed the poster for Sylvia next to the door. Jarrah heard them talking about it and rushed over. "Mommy's in that show!" she shouted. The girls turned to look at me, perhaps admiringly. "Are you in Sylvia?" asked one. "I am," I said, smiling. The girl turned to her mother. "Is that a grown-up show?" Even though the question was not directed at me, I figured I would take it, being the authority and all. "It is a grown-up show," I said. Intrigued now, the girl crossed the porch so she was standing directly in front of me. Jarrah followed. "And does it have bad words?" "It does," I confirmed ruefully. "It has a LOT of bad words." "And Mommy says most of them!" Jarrah shouted. Now the other mom really wants to be my friend, I can totally tell. He's back now, and was the belle of the ball, as usual. But don't take my word for it. These people interviewed him about the future of 3-D cinema, and while I can hardly understand a word, I find him incredibly adorable as well as unintelligible. And if you're more of a tech-head than I am, you might actually understand what he's saying instead of just marveling at the many ways he's able to use the word "channel" in a sentence. Me, I've been sleepwalking through the week. Part of that is my fault, since I threw a dinner party the night David left and didn't go to sleep until 4:00 a.m. Since my nanny and house staff were maddeningly MIA, I also had to rise at 7:30 to get Jarrah ready for school, which included preparations for Jarrah's Special Spider Day, the parameters of which were fuzzy to me (ha!) but necessitated printouts of an Australian Huntsman spider (one of whose ilk jumped into my cleavage when I was visiting that fair land--she totally forgot to tell the class that crucial detail) and a vibrating toy spider with glowing red eyes that sings "Witch Doctor" in a basso profundo which burrows into your brain for the rest of the day. The next night I hoped to snooze stone-like for eight hours, but instead I answered the 3 a.m. call of "Mommy!" shot like a rocket from my cozy bed. Per usual, it was a "my covers have fallen off" kind of emergency, the perpetrator of which was asleep again before they'd even been replaced, after which I lay awake for the rest of the night thinking "Oooh, it's the middle of the night. And I'm alone. I should go back to sleep now. Okay, now. NOW. How about now? No?" So Tuesday I was pretty much a zombie all day and then had rehearsal at the end of it. I am not feeling good about my performance at the moment. I am way up in my head and getting more embedded there with each passing day, to the point where my director has given up offering suggestions and started shouting things like, "Say it like THIS!" He also suggested that I might move around the stage like I have some business there instead of just rocking back and forth like Rainman. Well, maybe he didn't say that exactly, but I can take a hint. Tired as I was, there were some highlights. I enjoyed cooking (and eating) dinner with friends Sunday night (and a big shout-out to Steph for taking J. to the park while I cleaned.) And meeting Mary and Joy for shopping and dinner Monday night. Late-night phone chats with my friend Bryan, which reminded me of my single days--he still makes me laugh like crazy. And Wednesday, Jarrah and I had our Fourth Annual NAB Girls Night with Grace and Julianna, which always includes take-out Chinese and angel cake with strawberries, but had a fabulous new addition this year: Smoke-Free Dance Party in our living room to the soundtrack from Glee. Whee! And I can't go without mentioning how David's annual absence has a way of throwing into relief just how much Jarrah has grown and matured. That first year, I was terrified to be alone with her and her myriad and arbitrary needs and near-constant diaper fiascos. This year, she was in school each morning, and the rest of the time was quite agreeable and fun. We had one small skirmish over a bikini she convinced me to buy her at Sears (very modest--I'm not a big believer in kiddie bikinis) which seems too small to me and I want to return it. I explained that I'd get another size, but it's possible J. did not hear me over her constant shrieking that I "cut the tags off right now! You promised!" The kid has a thing for swimwear. Jarrah: Mommy? What happened to her? Sam: What happened to who, sweetheart? Jarrah: In the song. Who he's singing about. Sam: Um, I'm not sure. He's just remembering the night they met and had a great time...dancing. And talking. And it was really fun for him, but for some reason he never saw her again. Sam: Oh, well, I think maybe they just didn't keep in touch. Or she might have moved away. Yes, I'm pretty sure she moved away. Jarrah: That's not what happened. I think she died. Sam: Oh, I don't think so. It's a happy song. Of all the things I might have liked to pass down to a child--my green eyes, my curls, my sunny disposition--what I seem to have magically shared is my lousy teeth. Granted, I haven't always considered them lousy. They're pretty straight, and white(ish), and by gum, they're all there. But until I started meeting other adults who said things like "What's that like, getting a filling? I think I had one when I was 14." and "Oh, I love going to the dentist! We have such good talks!" I thought I was lucky. I had this amazing dentist back in the '90s who said "Never let people dig around in your teeth unless they absolutely have to. You only have so many teeth, and you ain't getting any more." That might be paraphrasing a bit. But I took it to heart. For five years, she cleaned my teeth, crowed over my healthy gums, and sent me on my way. Then she retired suddenly and her replacement tried to kill me. At least that's what I think she was doing, because suddenly my mouth was a hotbed of decay and every time she tried to drill, I practically hit the ceiling. And that was after eight shots of Novocaine, a couple Valium and a shot of whiskey. I found a new dentist. Same drill (ha!) Either I wasn't numb, or numb just didn't help. I developed a terrible fear of all things dentist. I cried more times than I care to admit, confessing my fears to anyone who'd listen that I'd lose all my teeth before I could sit still to have them fixed. And, suddenly, they needed fixing all the time. The revolving door of dentists told me I grinded them down to nubs and needed nightguards, that they were riddled with hairline fissures that would eventually make them snap right out of my mouth, that my childhood silver fillings were leaking into my brain, and that every time they put in a new filling, I managed to "lose" it in six months, so terribly did I treat them. On my own, I noticed new, disturbing trends, like the fact that every time I ate rock candy (mmmm, rock candy) I'd end up eating a chunk of my own teeth, which I wouldn't know until I looked in the mirror and smiled back like Huckleberry Finn. What, had the warranty run out? Were the teeth in my mouth no longer good for tooth-like functions, like chewing and...living? I lost my last dentist in an insurance switch-over around New Year's, and dragged my feet about finding a new one. Finally, I decided if my five-year-old could lay there and watch Spiderman without crying while she got SIX FILLINGS in two months, I could probably give this dentist a whirl myself. I told her about my anxiety, and she suggested I start with a cleaning. No problem, I thought. I can handle cleanings. That was this morning. I settled into the chair and the hygienist pulled The Devil Wears Prada in front of my nose. Note to self: Do not watch a movie about six-foot-tall models in hundred-dollar underpants while you are seeing your reflection in the screen, spread out like Jabba the Hut with about six tools in there. First, the x-rays. I know from x-rays, or so I thought. They ram some cardboard into your soft palate and tell you to hold still, no biggie. But today, they did that about 73 times. "Um, how many are you going to do?" I finally gasped, swallowing hard so I didn't barf on her. "This is what we call a full set!" she exclaimed gleefully. "The insurance company only lets us do it once every five years!" Wow, I never thought I'd be thankful for something about the insurance company. Then the dentist loomed in, and my head went way, way back. "I've never been so low before," I whispered. "Is that a problem?" she asked. "Um..." But she was off and running with something that made an incredibly loud, piercing noise. I raised my hand. She stopped. "What is that?" I whispered again. "I've never heard that noise." "It's an ultrasonic plaque remover." "Just invented?" She laughed. "Not even. Been around forever." I lay back and tried not to freak out about the noise and wondered if maybe my last dentist was a Cave Dentist, or maybe Dentist to Henry VIII. Why had I never had this before? In any case, she was at it for like 30 minutes. Not that it helped me avoid the regular scraping. There was plenty of that, too. There was also a lot of shooting air at my teeth with the question "That hurt?" Um, yeah it does. It all hurts. I turned up the movie and tried to block out the near-constant "Oh, put down left occlusal bucal frontal sidal backal inbetweenal on 15. It's a goner." After an hour of this (I only wish I were making this up) my teeth were squeaky clean and it was time for the bad news run-down. I have very few teeth that are not in grave peril. Pretty much they all need to be pulled and replaced with those shiny white things you see on reality makeover shows. That's a slight exaggeration. But I do need to go back for fillings...FOUR MORE TIMES. Mostly, I think, because she's afraid I might go all postal on them and start hurling instruments into people's eyes, because she is philosophically opposed to the lovely, lovely nitrous that kept me drooling and pliant at the last dentist. "I'm not opposed to it," she corrected me. "You just don't need it. You're going to be fine." Huh. We'll see about that. Next time, at least, I'm watching a zombie movie. Oh, she did say I'm a good flosser. Which I already knew, thank you very much. Jarrah: Can I have one of those orangutans? Jarrah: You know (making something small with her hands) those orangutans. Sam: I need another hint, lovey. Jarrah: The round things, that are white? Sam: Meringues! Yes, you may. April 1st was our five-year anniversary of living in this house. Not that we remembered it then. But I thought about it just now when we noticed that the silverware drawer was filled with matzah crumbs and David volunteered to empty and clean it. As you might imagine, this stuff was taking up more room than the silverware was. Now the drawer is freshly 409'ed and shiny, and looking strangely empty. Our child is almost five and a half, and today is the first day it's occurred to us to look back there. You can just imagine what all the other drawers in the house must contain.